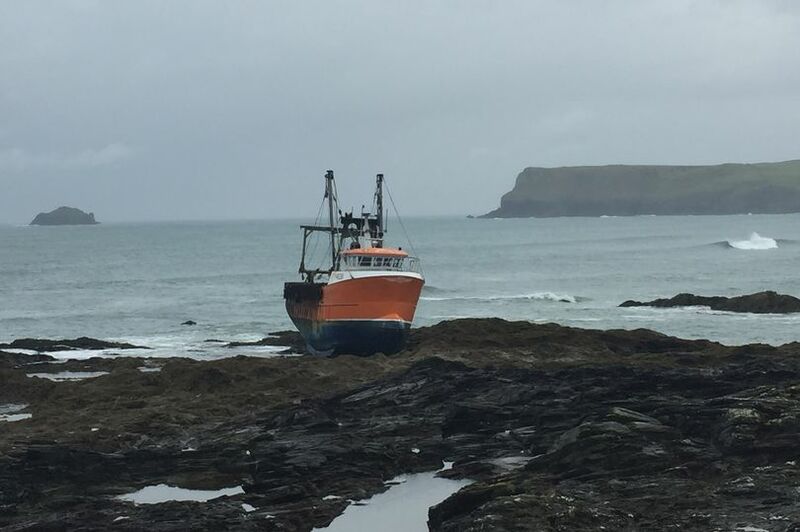 A £1 million trawler which was left high and dry when it washed up on the Cornish coast (September 5) has been refloated. Le Men Du, a Cornish registered fishing vessel, was found yesterday morning on the north coast of Cornwall at Greenaway near Padstow. According to Marine Traffic, a website showing live vessel positions, the ship washed up on the rocks at about 6am. All crews were confirmed to be safe and coastguard attended to protect the ship and stop the public getting too close to it. “Padstow RNLI helped the vessel to safety around 7.30am this morning,” Jonathan Cooksley, from Free Maps of Cornwall, said yesterday. He also shared on the website pictures of the three-year-old 15-ton scalloper trawler that was said to cost £1 million. The fishing boat, which is 15 metres long and 6 metres wide, is now back on the waters after it was refloated last evening with the high tide. It left Greenaway at about 4.40pm, according to Marine Traffic, and is now at Padstow Harbour.